A doctorate in folklore may seem to be an unusual background for a writer of juvenile fiction, but it has served Janet McNaughton well. "I was born in Toronto, Ontario, on November 29, 1953 and spent the first 26 years of my life there. I did a BA at York University in something called individualized studies, basically Canadian Studies without the French. While at York, I did a number of courses with Edith Fowke, and that was how I got interested in folklore which was what brought to me to Newfoundland. I moved to St. John's in 1979, did a Master's degree in folklore, graduating in 1982, and then went into a Ph.D. program. I got married, had a baby and didn't graduate from the Ph.D. program until 1989-90." "I didn't have a goal in mind when I went to university. Nobody in my family had ever gone to university before. Because of the Depression, my mother didn't even get to go to high school. I'm the younger of two children. My sister, who now has a court reporting business, took the 'commercial' stream in school. As my parents really wanted a child who would go to university, I was it. They actually wanted me to be a teacher, and I tried doing teacher training at York in a concurrent BA/B.ED program, but I never fit in. I was just always at odds with some aspect of the school system. However, by fourth year, I knew I wanted to come to Newfoundland because it was the only place in Canada you could do graduate work in folklore. When I made that decision, I just folded all my B.Ed courses into my BA and graduated. My master's thesis at Memorial was on the festivals organized by CP rail and held in CP hotels across Canada. I focused on those held at the Chateau Frontenac between 1927 and 1930. My dissertation was completely different. I did it on midwifery and the medicalization of child birth in Newfoundland, something that's happened in living memory so I could talk to women who had been midwives or had babies delivered by midwives. I was looking at the way in which the transition had been made from just neighborhood women to doctors." "By the time I finished my Ph. D., I realized I'd made a terrible mistake. When we entered the program in the early 80's, we were encouraged to believe that folklore was going to be an expanding discipline. Of course, during that time, nothing expanded. There were no jobs. Of the four people I did my degree with, only one ended up with a job in folklore. Of the remaining three, one runs a bed & breakfast and brings in German tourists to Newfoundland, another, me, is a children's author, and the third is an independent scholar." "I'd always been interested in writing and had done some creative writing courses when I was an undergraduate, but, ironically, I didn't specialize in creative writing because I didn't believe you could support yourself doing it. With the doctorate completed, I had a toddler, and nothing to do with myself. I knew that I'd probably go crazy if I didn't find something intellectual to occupy my time, and so I started writing magazine articles. A friend who had column reviewing children's books in the Sunday Express, a local weekly newspaper, said, 'I'm going back to medical school. Do you want my column?' And I replied, 'Sure.' When the paper went out of business a couple of years later, I didn't want to stop reviewing children's books, and I sent samples of my work to Quill & Quire who hired me to review. I think my being a reviewer before I was a writer of children's literature was a very useful exercise. I learned a lot about what's good and what isn't. When you review seriously, you learn very rapidly that publishers often have no idea what they are doing and that a lot of the stuff that's out there shouldn't have been published to begin with. It was a very good apprenticeship for me." Janet characterizes her transition from reviewer to writer as "really silly. I was asked to be on executive of the Writers' Alliance of Newfoundland and Labrador. I thought,'They think I'm a writer. I should write a book.' So I started writing, and the first thing I wrote was actually a 100 page draft of To Dance at the Palais Royale. It wasn't very good, and I couldn't get it published. I didn't tell anybody I was writing because I was afraid I might not be able to get anything published. By being quiet, I wouldn't embarrass myself." "While the draft of Palais Royale was out not getting published, I thought, 'Well, I learned a lot from that experience. Maybe I could do better.' And so I started writing Catch Me Once, Catch Me Twice. In that book, I drew the factual stuff very much from what I'd learned doing my doctoral dissertation, and so that's why Ev's grandfather is a doctor and Peter's grandmother is a midwife. I knew they could be of very different social classes but could end up at a school which was one of the very few in St. John's at that time that was coeducational. In Catch Me, they're actually in the same class, but when they get to Prince of Wales in Make or Break Spring, the classes are separate. Once I started Catch Me, I realized that a St. John's friend and writer, Helen Porter, not only went to the schools that these kids went to, but she was the same age as Evelyn and could tell me very precise detail. For instance, I wouldn't have know that the person who ran the school would normally have been a man called the headmaster but that, during the war, the school had a woman as the headmistress. As well, I wouldn't have known what the students did when the air-raid sirens went off. Helen read my draft and corrected any of the factual things I hadn't gotten right." Catch Me Once, Catch Me Twice contained what one reviewer called a "seamless weave of the natural with the supernatural." Janet explains how fairies came to be part of the plot. "My friend Barbara Rieti was the only other person I knew who had a baby and was also trying to do a doctoral dissertation. She was studying fairies, and so sometimes we'd both get sitters for the day and go off and do fieldwork. I'd listen to her interview somebody about the fairies, and then we'd drive up the road, and she'd sit and listen to me interview somebody about midwifery. Fairy beliefs in Newfoundland are very interesting. The dissonance between the natural and the supernatural that we have in our world view isn't part of the traditional Newfoundland world view. You can be walking along in the middle of the bright and sunny day, and all of a sudden you're lost, and you know that the fairies have confused you. Finding yourself in such a situation, there are various things that you can do, such as turning your pockets inside out, to get yourself turned around to go back again. That kind of separation between natural and supernatural is not part of the traditional world view, and that was part of what I was aiming for. Of course, because you're writing fiction and not an academic paper, you mostly can't say what it is that you're trying to do." Janet's folklore background also came into play with To Dance at the Palais Royale. "The last course I did for my BA was an oral history of my mother's family's immigration to Canada and that told me a whole bunch of things that I hadn't known before. It was interesting because my mother is the second youngest. She was eight when they immigrated, and her perception of what had gone on and her memories of Scotland were completely different from those of her older sisters who had to face more of the harsh realities of life there, and so it was very good to talk to my three oldest aunts, Jean, Barbara and Janet, about what life had been like in Scotland. They were all domestic servants and had come to Canada on reduced passage just the way Aggie and Emma do. If I had only had my mother's experience to go by, I would have had a very romanticized view of the past that an eight-year-old could afford to cultivate but a 14-year-old who was out of school couldn't. Just like Aggie, my oldest aunt, Jean, hadn't wanted to come. It was my Aunt Barbara's idea, and she got everybody to jump on the bandwagon with her. They were all going to Canada. Maybe it's not true of the two Newfoundland books, but for some reason, I feel compelled to write about the less interesting character. Aggie is not the more interesting character, but I want to write about the mousy one that doesn't get noticed. Maybe that's because I was the mousy one that didn't get noticed. I guess that most adolescents do feel that way." "When I wrote Palais, I knew that, although my main character was 17, my target audience was actually girls who were early adolescents, and I wrote Aggie's experience with the sensibilities of that audience in mind. One of the reasons why its nice to be able to go back to a time when girls were pathetically innocent is that it allows you to address that sensibility. Because our kids today don't have the same kind of innocence of knowledge, but they still have the same kind of innocence of experience, that means that, when you talk to them about things like sexuality, you have to have a very light touch and that is what I was trying to do. A lot of what I do in my books is more conscious that it probably should be, or maybe I just figure it out in retrospect, but there are always a lot of ideas in my head when I'm working on stuff like this." "In The Vertical Mosaic there's a quote about how it's easier to see the class system from the bottom up, and I think that that's true. I want kids to think about things like that. I want them to know that there was a time when your parents said, 'Now you will go to Canada and make money to bring the rest of the family,' and you didn't say no. I think it's very easy to assume that the world has always been the way that you find it, and, of course, it hasn't. Similarly, it's interesting with Catch Me in that the character who gives kids the most trouble is not the scary soldier; it's the grandmother. They always ask, 'Why is Evelyn's grandmother so mean?' The answer is that she's just behaving like a typical grandmother of that time period where she's sort of an adjunct parent, and it was her job to bring this kind of aberrant girl in line. Today, grandparents are like old playmates. I wanted readers to realize that things are different, that things can change." 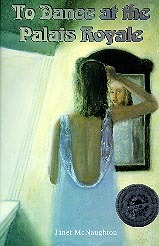 Janet's third historical novel, Make or Break Spring, was a sequel. "Kids here in St. John's were very much upset about the fact that Catch Me had ended on such an inconclusive note. Readers don't like that, and I had had ideas about the characters themselves. Things about the scholarship in the first book suggested a story to me, but I also really wanted to take the story to the end of the war. I'd left it in 1942, a very dark, uncertain time in the war. I thought, 'You know, it's like two sides of the coin. You have the dark early winter period where the war's very uncertain, and then you have the opportunity for the spring when the war's ending and everything looks much better actually.' The horror that was to come with Hiroshima and Nagasaki hadn't happened yet, and so the European part of the war ended, except for the death camps, on a very happy note. I left the camps out because I didn't see anything in the papers that would suggest to me that people knew yet what had gone on. Make or Break Spring was a way of wrapping up the story and of getting the characters out of my head as much as anything because they had continued to live. They don't now." With her fourth book, Janet took a new direction. "The Secret Under My Skin was harder to write because it was a different genre. I did that deliberately because I'd done three books of historical fiction. I'd come from a kind of historical research background, and I knew what I was doing. I think there's a danger when you know what you're doing too well that you're going to lose your creativity. You have to really keep yourself off balance if you're going to produce something that's interesting and creative. I was certainly off balance while I was writing Secret. There were times when I felt I was just floundering around in the dark. In creating a new world, I fell back on a lot of the stuff that I knew from studying folklore. The beginning of the book where the kids do the ceremony and are told to avoid this terrifying man, I took that right out of some work that another folklorist had done on camp legends." "There are a lot of things that I knew about that world that I created that I couldn't fit into Secret because these people that I was writing about are in one very isolated backwater. I have an idea for another book that would use the same characters. I don't know whether I will do it or not, but it would take them into the rest of the world. It would actually be a kind of truth and reconciliation process that's going on in the aftermath of the fall of this government, and then my character would find out a lot more about what had actually been going on and what life was like for people who didn't share her very straitened circumstances." "There's always a lot more that you know. Being a writer of fiction, you have to learn what to leave out, and you have to recognize the fact that there are things that you know that you won't tell the reader, and there are things that you know that you will try to tell the reader in ways that you know that they might not be able to get. There's a couple of points in Secret where I know more about Blay's situation than she does, and she reacts in ways that are governed by her personality, especially at that point when Marrella says to her, 'I picked you because you'd never be a threat to me.' Blay takes that very badly, but I think the other character meant it ironically, but Blay doesn't see that. I couldn't let her see that. She wasn't capable of seeing that irony. She's just overwhelmed by hurt. A danger of using a first person narrator is that you know that your narrator isn't always going to be reliable, but you don't know whether your audience will pick up on when your narrator's being unreliable or when your narrator just doesn't see things that you, as author, can. To me, one of the stylistic challenges of writing is that I have to accept the fact that everything that I know can't possibly go into the book. Sometimes when you read beginning writers, you can see where they have tried to put in everything that they knew and it hasn't worked." "One thing I did have in mind in Secret was that I would play a little bit with gender roles. It would look as if a character was a typical housewife, and then you would find out that she was actually a very important person in the resistance. I have been bothered by the kind of ghettoization that goes on in young adult literature where all you are exposed to are young adults. I think that's very unrealistic because there's a lot of generational interaction that goes on in the lives of most young adults. I was conscious of the fact that I did want my books to be more realistic, and so kids do interact with people of other generations. I really worked myself into a corner in Make or Break though because I ended up with a character who was 2 � years old. It's very hard to 'write' a 2 � year old. Actually the editor I was working with on that book said she found him annoying." "With Blay/Blake, I figured, 'This kid's so good at everything she does. I have to give her something she really can't do,' and that was one reason why I made her a weaver. Also, I'm really interested in 'the hunger for knowledge' as a theme. It was something I had when I was a kid growing up in a working class family where my parents hadn't had much of an education. My husband is the same, but it isn't something that you see a lot of today. Most of what goes into my novels isn't out of life. I don't admire writers who write out of their own lives. I think real creativity involves not just digesting your own experience and putting it down on paper as fiction, but one thing that I was very definitely working out in my own life in Secret is the whole feeling that being allowed to learn is a wonderful gift, and most of our teachers aren't seeing this in kids at all. Their students think they're being punished or in some way being kept from what they really want to do. And I love to learn, and I'm still learning things all the time. I wanted to try to communicate that enthusiasm for learning. That's one of the reasons why Blake is the kind of characters she is, but I needed to prove that I knew that she wasn't perfect. Also I'm terrible with my hands too." As to her output, Janet observes, "While readers would like a new book every year, that would kill me. Some people can do it, but I can't. Every two years is about what I can handle. It's really arduous actually, but it's a pace that I feel is probably necessary. It requires me to be at work at my novel almost all the time. Now, I only usually write half a day because you can only generally see that far ahead in the plot. I write in the morning and try to write 10 pages a week. Consequently, I write two pages a day. Sometimes I'll write more, and I've actually been in situations, such as the end of Secret and with Make or Break, where I got to the point where I couldn't stop writing. That was horrible. I would try to leave the computer, and I'd have to come back and keep writing because the story was just propelling me to write. Normally though, I'll write for half of the day, and then, while I'm doing the rest of the things that I do for the other half of the day, the plot will be sort of formulating itself in my head so that I can carry it forward the next day. But it really does require me to work the five days a week. I guess I'm fortunate to live where I do in that I have very few distractions. I do very few school visits because the economy here doesn't really allow it. I do very few conferences, and I'm not invited away a whole lot." "I'm also very happy working at home, being a domestic person and having my domestic life around me. In that way, it's a comfortable way for me to work. But I find that I have less time to spend with my friends. I have less time for a lot of other things although I've been doing an awful lot of volunteer work. We just put poetry on the buses, and I was on that committee; I've been on the Eastern Horizons Conference for two years; and I'm on the national council of the Writers' Union of Canada. When I get those kinds of distractions, it gets harder and harder to do my writing." Janet says that her books "start in my imagination. I'm a person who does a lot of daydreaming. I always have been a daydreamer, and I have these ideas in my head that just kind of formulate gradually. When I'm actually ready to sit down and write a book, I'll do a lot of researching, and a lot of my ideas come out of my research because I have no plot. I start with characters. I don't start with plot at all. Then I'll sit down and start to write. It's kind of a process of the story unfolding. I usually write from beginning to end. But with Secret, I got a little bit into the story and realized that there were things that needed to be structured in different ways and things that I could do to bring out the drama, and so I went back and rewrote. Then there were things that I knew about the society that I hadn't known when I started writing because it was a whole process of discovering what was going on. Consequently, after about three chapters, I stopped, went back and started from the beginning, rewrote the whole thing and then wrote on." "But normally I would just write from beginning to end and then rewrite. So, I'm pretty methodical in the way that I write. I don't know how the plot is going to end. In Secret, I didn't know that Fraser, when he came into the story, was Len Howl's son. And I had Hillary in the book a long time before I realized that she had actually stolen Blake. There are always things that come into the plot that surprise me, or characters come with their own agendas. That's a hard thing for other people to understand, but characters do have their own ideas about what they should be doing in my books, and they will often assert themselves in ways that I hadn't expected. I never fight them. If you fight your characters, it's always going to look contrived. If you want to keep the kind of organic flow of the plot, you should let the characters do mostly what they want." "People have a hard time trying to figure out why I write for children, and, for me, a lot of it is political. Everything I do is political I guess. I'm very interested in the concerns that adolescents have. I still remember, pretty vividly actually, what it was like to be that age. I think adolescence is a time when you formulate a moral attitude that will take you through the rest of your life, and, to me, that's the really interesting thing. You can actually address moral issues in adolescent literature in a way that you'd never be able to get away with if you were writing for adults. That's very appealing to me because I'm very concerned with moral issues. For some reason, the way in which most adults are able to shut down and stop feeling indignant about the world never happened with me. I just go around feeling indignant all the time. Part of it might be that I'm married to someone who teaches political science, and politics is kind of a spectator sport in this house, but I do have this sense of moral indignation that adolescents have that just doesn't seem to be able to scar over the way that most adults can." "I'm very lucky because I came along as a writer in a writing group. It's a very large group called the Newfoundland Writers' Guild. It's open to everyone unlike most writing groups where you have to be invited. I really am grateful for the fact that I had that kind of discipline where my work was critiqued and people were focused on just the pure writing. I think a lot of people don't get that. Now, I finally have an in-house editor with HarperCollins. Before that, anyone that my publisher could afford I could have. I wanted to be the one who would find the editor because I wanted someone who was specifically interested in young adult. I was very lucky to be able to have Peter Carver for Palais but then he went to Red Deer Press and was no longer available. I'd worked with Marie Campbell at Quill & Quire where she'd been one of the 'Books for Young People' editors. I knew that we thought very much alike, and so it's been wonderful being able to work with an in-house editor from whatever point I wanted to bring her into the process. Basically, with my first three books, what I was getting was a last draft edit, and before that I had to come up with ways to ensure that all the editing was done myself. A lot of that was feedback from people in the Guild or other writers whose judgement I trusted,. It's been a kind of seat-of-your-pants experience which has been good. It's made me very independent." First a reviewer, then an author, Janet has now also become an editor. "I've done three or four books for Creative, and I feel very strongly that it's the author's name that goes on the book, not mine. The mistakes have to be the author's. For instance, there were a couple of things that HarperCollins suggested, such as wanting me to make the sexual abuse more overt in Blay's past, and I said no. Marie as well had her doubts about the whole idea of romance in the book and thought that, at the end, it was just too neat to have those two couples so nicely wrapped up. I said, 'The mistakes in the books have to be my mistakes.' Because the book has my name on it, I don't have any trouble with mistakes as long as they were mistakes I made. If it was a mistake that somebody else had made for me, I would feel a lot worse about it. Integrity of my work is really important to me because there is very little monetary reward to writing. You work like mad, and you get so little return in so many ways that I figured one of the few things that I do have, that I didn't have when I was a magazine writer, is the right to control what goes into the books." Having written two books about Ev and Peter during World War II, Janet's completing a trilogy might seem a natural conclusion, but she says, "I don't have any desire to write about those characters again even though people keep asking if there'll be another. I think the sequel business is a real trap for a writer. I don't think it made Lucy Maude Montgomery very happy to keep churning out those Anne books, and you can see the deterioration in the quality of the work. I certainly don't want to get into that. I'm not in the business of satisfying the desires of my readers as much as I am in the business of taking them on a journey that I can guide them through." "I have a new book coming out this June which is another departure for me because it's contemporary fiction, and it's a junior novel, for grades four and five. It's called The Saltbox Sweater. The story is very straightforward, about a ten-year-old girl, her mother and her grandmother, and how they find a way to stay in their home community, which is a Newfoundland outport, after the local fish plant closes. I wanted to write a story that would help explain why people want to stay in these small communities when everyone else thinks they should just be willing to pack up and move to some other part of Canada." "My next book's going to be completely different. In my BA days, I was also a folk singer and sang in French with another woman in Toronto. I really loved the Scottish narrative ballads which is something that's coming into my next book. It's going to be set in Scotland in the Middle Ages, and I'm going to use two Scottish narrative ballads for the plot. 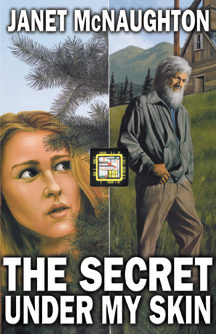 When I was writing Secret, I had no idea if anyone would like that book or want to read it. It was just something I had to write, and that's the way it is with this book too. I don't know if anybody's going to like it or want to read it, but it's what's up next for me." "I'm going back to the fairies for this next book too. I'm not sure how I'm going to handle that fantasy element because I'm a person who puts a lot more stock in realism than in fantasy. I think fantasy is wonderful when it can be achieved in books, but it's sort of like religious faith - either you've got it, or you don't. You can't manufacture it. The Secret Under My Skin was very consciously an anti-fantasy book in a lot of ways because I was trying to do things with our relationship with science which seem antithetical to our relationship to fantasy in the world that we exist in. In fact, I think if we could approach science in the right frame of mind, we would find a lot there that is very magical. I was very influenced in writing Secret by one of Carl Sagan's last books, The Demon Haunted World, which is about how people want science in their lives, but what they end up with is pseudo-science. It's a kind of a dangerous thing in our society for people to feel so separated from something that influences our lives so heavily." Reflecting on her writing, Janet says, "The books kind of mull around in my brain for a long time before they pop out, and I really don't have a whole lot of conscious control over what I do next. I can't say, 'Well, I'd rather write another book now.' It's sort of like they ripen and are ready to fall off the tree, and I have to be there to catch them. It's a lot more work than that, of course, but I don't want to get into a rut. I'm worried about just sticking with a formula. I would hate to see that happen. It's a conscious thing. I keep pushing myself to try something new." Catch Me Once, Catch Me Twice. Tuckamore Books, 1994. 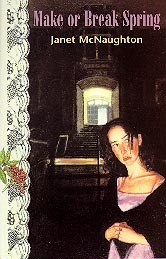 Reprinted by Stoddart, 1996. Grades 5-9. Make or Break Spring. Tuckamore Books, 1998. Grades 5-9. The Saltbox Sweater. Tuckamore Books, 2001. Illustrated by Nancy Keating. Grades 4-5. The Secret Under My Skin. HarperCollins, 2000. Grades 6-10. To Dance at the Palais Royale. Tuckamore Books, 1996. Reprinted by Stoddart, 1998. Grades 6-10. This article is based on an interview conducted in St. John's, NF, on October 17, 2000. Visit Janet's home page at: www.janetmcnaughton.ca. 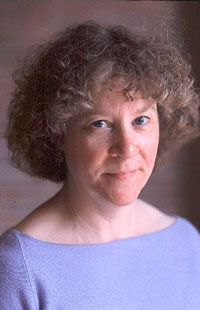 Author photograph by Greg Locke.